This particular edition has a White sticker with the band name, catalog number (50008 Ⓑ), Atlantic logo, and 'Distribution WEA Filipacchi Music'. It also has a two-sided insert in lieu of a printed inner sleeve. 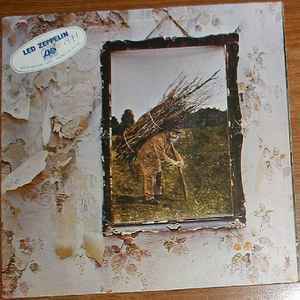 This is a repress of Led Zeppelin - Untitled that uses the Green/White/Orange Atlantic center label instead of the red/plum center label of the first press.